Goodreads: The World 's #1 Personal Development Agency . . . has to prove it. What if you brought together five top personal development experts equipped with virtually everything we know about unleashing human potential and gave them some lives to change? Could they really coach anyone to lose fifty pounds, fix a broken relationship, or get rich? What would they do for a homeless person, or a pro-golfer trailing at the back of her league? How about taking the racism out of a racist, or turning a hellish employee into a ray of sunshine? Welcome to Quest, Inc. They say they can change your life. Now, as they re followed by an investigative journalist from one of the world 's leading news publications, they have to prove it or be damned as charlatans. Based on real life peak performance and transformational strategies, you ll see the highs and lows everyone faces on the road to self-realization especially the experts. Get ready for breakthrough . . . or breakdown. Kritters Thoughts: What an interesting book, that even after finishing it I am still trying to pull my thoughts together! From the synopsis, I wasn't sure if this was fiction or non-fiction and even after the first few pages, I was still a little confused. The beginning starts with a former self help fitness guy who has clearly fallen off the train that he created himself - gained weight, marriage about to fall apart and just loosing his life in general, so his former self help friends intervene and help him put his life back together. After the come together to help him in his pursuits that decide to start their own company to do the same thing for others. This is where the book picked up, but became choppy and almost moved too fast. Their clients quickly rolled in and then out and the reader wasn't given the opportunity to really get to know their situations. I wish the author had spent more time and had fewer clients. This was definitely a different book than I normally read and I enjoyed taking a chance, but it didn't quite live up to what I thought it would be. Disclosure of Material Connection: I received one copy of this book free of charge from Tribute Book Tours. I was not required to write a positive review in exchange for receipt of the book; rather, the opinions expressed in this review are my own. Kristin, thanks for taking the time to read and review Justin's book. Thank you for your review Kristin. 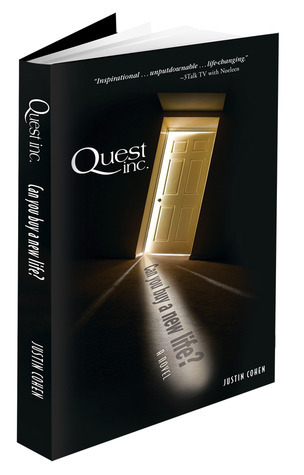 Quest, Inc. follows a TV drama style structure with multiple story lines that move at a rapid pace. I am currently working on the sequel and so your feedback is very valuable to me.